As witnesses recount the horrific crime at Sandy Hook Elementary, one constant is emerging: Even more children would have been killed had it not been for the actions of teachers, a custodian and even the students themselves. "A lot of children are alive today because of actions the teachers took," School Superintendent Janet Robinson told NBC's TODAY show on Saturday, a day after a gunman killed 20 children and six adults at the K-4th grade school in Newtown, Conn. Principal Dawn Hochsprung and school psychologist Mary Sherlach, both among those killed, were said to have run toward the gunfire as it broke out, with Hochsprung lunging at the gunman, according to town officials. Hochsprung was coming out of a meeting when she confronted the shooter, Board of Education chairwoman Debbie Liedlien said Saturday. Jeff Capeci, chairman of Newtown's Legislative Council, said Hochsprung's actions were nothing short of heroic. "From what we know, it's hard to classify her as anything else," he added. Mary Ann Jacob, a school library aide, told reporters Saturday that she was with 18 fourth-graders when she heard "popping sounds" and realized shots had been fired. "I shouted 'Lockdown!' and I ran across the hall and told the other class," Jacob said. 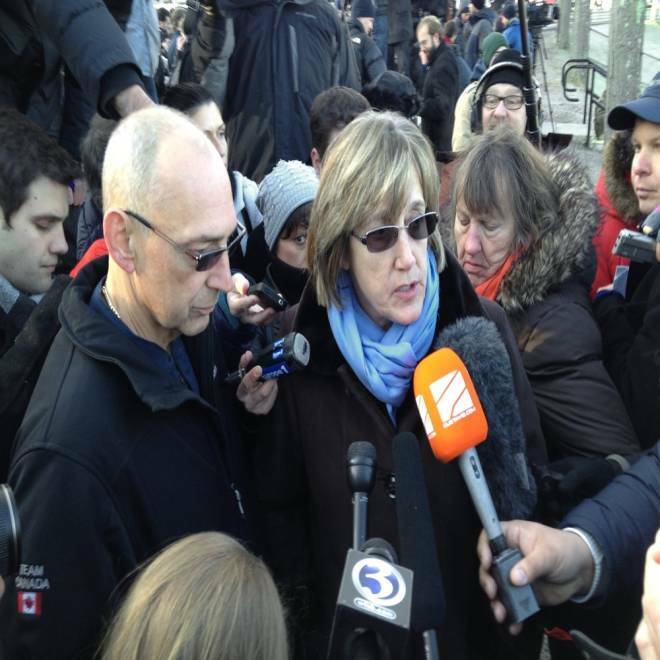 Sandy Hook Elementary School library clerk Mary Ann Jacob speaks to the press in Newtown, Conn., on Saturday. Music teacher Maryrose Kristopik also took her students to a classroom closet. "We stayed quiet, we held hands, we hugged," Kristopik told the New York Daily News. "I tried to talk to them calmly." First-grade teacher Vicki Leigh Soto, 27, lost her life as she "huddled with her children," her cousin Jim Wiltsie told the Wall Street Journal. She had tried to hide them in a closet, he added, and "in doing so, she put herself between the kids and the gunman's bullets ... She was a hero for what she did." Wiltsie did not know if her students were among the dead. Another unidentified teacher grabbed 8-year-old Bear Nikitchyuk from a hallway and into a classroom as bullets whizzed by, NBCNewYork.com reported. A custodian warned of the gunman by running through the halls, said 4th-grade teacher Theodore Varga. Even some students were able to muster up courage as shots were fired around them. One student claimed to know karate, The Associated Press reported. "It's OK. I'll lead the way out," the student said. School Superintendent Janet Robinson talks about the heroism of teachers and says the shooter's mother was not a full-time teacher at Sandy Hook.